The first true sit-walk capable desk we encountered apart from the venerable Steelcase Walkstation. 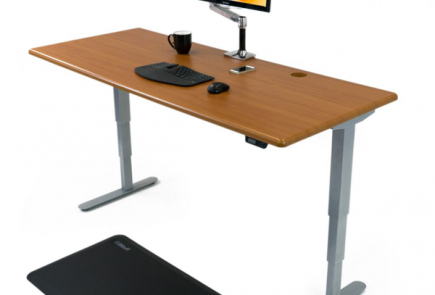 RISE desks are among the very limited number of desks that can stretch wide enough to accommodate a chair and treadmill at the same time. We were also impressed by the quiet, yet powerful motors of the RISE. Unfortunately, poor experiences with retail sales have led to a drop in our product rating. The product remains an excellent one for corporate buyers who buy large quantities and have them installed by professionals; however, our retail consumer-perspective scorecard criteria does not apply to those scenarios. Highly adjustable - both vertically and horizontally. RISE desks were among the first real options for a sit-walk desk, thanks to their wide range of width adjustment. A sturdy frame, quiet motors, and thick tabletops round out the RISE package. A fine product for the bulk-volume "contract furniture" industry, ISE failed to execute its strategy for making it a successful retail product, leading to their eventual pull-out from selling single units to consumers and smaller businesses. 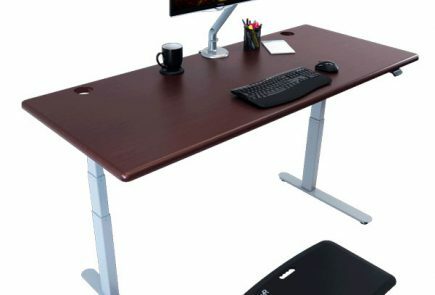 New desks from iMovR have since stepped in to fill the sit/walk gap in the market, are better-priced and better-featured, and ship in a fraction of the time. The RISE belongs to a rare class of adjustable height desks where sitting, standing, and walking are all possible. Its advanced base, complete with a LED height display controller with programmable preset heights and reliable safety features make it a good choice for stand up or treadmill desk users. Since its debut, however, other desks have been able to replicate and improve on the RISE's features. Now, good enough might not be good enough. With a stealthy 46 decibel sound signature, librarians and submarine commanders alike will prefer the RISE over almost any other desks - only iMovR’s line of electric desks (Lander, Energize, Cascade, Everest, Elite) can really compare (all in the range of 41 to 44 dB). Even ultra-premium options that claim “whisper quiet” mechanisms actually put out a relatively cacophonous 60 dB or more (remember the decibel scale is logarithmic). The MultiTable Mod-E comes in at a grinding 75 dB, though that’s by no means more offensive than other office sounds like a ringing cell phone. Speed & sound are generally a straight trade-off with electric-height desks, and the RISE is no different. Silent though they may be, they’re not the swiftest movers out there, at an average lifting speed of around 1.5 inches per second, versus 1.7 in/s for the Ergoprise Uprise, and 2.0 in/s for the MultiTable Mod-E. Yet compared to the Jarvis, UpLift, SmartDesk and most other popular desks the RISE is dramatically quieter and faster. RISE tables are ANSI/BIFMA certified, a fancy way of saying that they can cover a height range from 22” to 48”. Add an inch to that for the ultra-dense, ultra-durable tabletop (compared to 3/4" for most desks in this category). Time to grab yourself a no-compromise keyboard arm, because you’ve finally got yourself a desk you can mount it on. We’ve mentioned this problem before – many height adjustable desks have a central crossbar that limits underdesk real estate, making it difficult or impossible to install the rails that keyboard trays usually attach to. And we love our keyboard trays for their many ergonomic benefits, trust us on that one. The RISE desks, thank goodness, don’t have that problem. A “notched” supporting frame leaves enough room for a keyboard tray without sacrificing stability. Even the smaller RISE tabletops have over 20” of free room, more than enough for a standard 17” rail. While short rail versions of keyboard trays are available for use with adjustable-height desks, in many instances the keyboards can not be retracted all the way under the desk due to obstruction from the crossbar. Alternative keyboard trays like the iMovR Stowaway and iMovR Trackless designed specifically for standing desks are another really good way to go. Or you can attach super-ergonomic Elevon Keyboard Tray in 30 seconds without the installation hassle of a typical under-counter keyboard tray. RISE tables can also be customized with a few handy extras. An LED height-readout is a major bonus for shared workstations – knowing quantitatively how high you like to have your desk is always helpful. Upgrading the control panel also gets you three programmable height presets; again, very handy features if you’re trying to set up a multi-user workstation. Optional above-top and under-top power stations, as well as cable-control gutters and sleeves, are handy weapons in the fight against the electrical undergrowth that usually forms around height-adjustable desks. But the big news is all the different tabletop options: 14 colors, 4 edge trim styles, numerous edge trim color options, and an almost infinite number of sizes. Our favorite option? 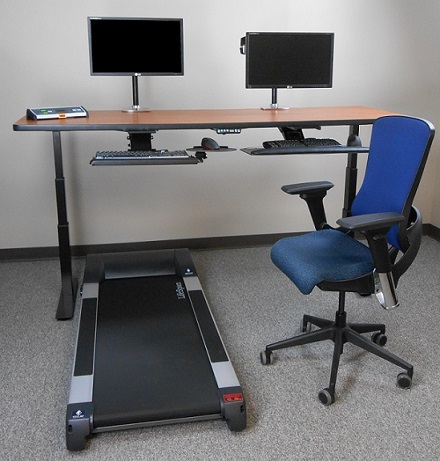 An extra large, 83" tabletop that gives you a desk wide enough to accommodate a chair and treadmill side-by-side for a full sit-to-walk workstation. The RISE was one of the first desks we encountered that could stretch to these widths, and provided a welcome alternative to the outdated Steelcase Walkstation. Since then, iMovR has added a few more options to the mix that are better-featured and better-priced than the ISE offering, but the RISE remains one of the originals. Most variable-height desks have legs that can be spaced out to somewhere between 50" and 55" – not enough to comfortably house a 29" wide treadmill base and an office chair side-by-side without getting your feet tangled up with the table. But a RISE? The adjustable-width bases on these things can stretch for days, and have no problems fitting the necessary components of a full variable-position workstation. RISEs can take 47", 59", 71" and 83" tabletops on their standard Medium-sized base (yes, there’s one even larger if you want to go crazy), and were actually the first adjustable-height desks we’ve seen that can do so. Most other adjustable bases max out at tabletop widths of 72" to 79". Problem is, their legs can’t spread nearly as far to accommodate true sit-to-walk setups, regardless of how wide their desktops are. It’s worth mentioning that RISE tables are cut to “pinch dimensions,” meaning if you want to put a 48" wide desk in a 48" wide cubicle you really need a 47" desk. We found this to be a real bonus in our treadmill desk trialing centers, where desks like the MultiTable scrape the cubicle partitions when they rise and fall. Of course, tabletops can be ordered without the pinch trim if you want that extra inch of wood for any reason. What we like most about RISE desks is how easy it is for every user to customize their ideal desk. There’s a dizzying range of options here. RISE tables come in two-legged and three-legged variants (for very large stations with 90-degree or 120-degree table tops, e.g.). The company offers hexagonal desks, right-angled desks, skinny desks, thick desks, and just about anything else you could ask for. Diverse tabletop options round out the package. We’re personally not fans of speckled patterns, but if you’re going for a Lighthouse theme in your office, then “storm” may just be the thing you’re looking for. Don’t worry though, the standard wood grain options are also available, and RISE comes in mahogany, cherry and maple – as well as basic white. Bases come standard in silver and black, as well as custom colors for the sake of desktop harmony – although that last option will more than double the cost of a base. ISE is relatively new to the adjustable-height game, but they’ve been around a long time – in fact, the company claims to have manufactured the first fully-adjustable office chairs. They’re a leading supplier of advanced desk furniture, keyboard trays, monitor arms and such to major corporate, educational, and government institutions. Check their website out for a host of other interesting products, as well as user guides, testimonials, and FAQs. The RISE table also boasts a fairly small eco-footprint. Many electric desks parasitically leech power while plugged in – not much, but it adds up. RISE tables, with their excellent .05 watt draw in standby, consume practically nothing while not in use. Leaving one plugged in and stationary for an entire year would only cost $.05 in electricity. These desks also meet LEED standards for green manufacture, and ISE bases contain no BPA, PVC, or halogens. One interesting part of their environmental policy that we’d like to highlight is their practice of reusing obsolete equipment. If a company decides to get rid of any ISE gear, that equipment is then redistributed, and sent to classrooms, non-profits, and other organizations that can still make use of it. All the positive things said above about ISE’s RISE product must be tempered by the fact that as a "contract furniture" industry manufacturer, ISE's normal domain is dealing large corporate buyers placing orders for hundreds or thousands of tables at a time. As a product normally ordered in bulk and assembled by teams of professional installers, we became aware that the RISE simply couldn't be transformed into a successful retail product. The challenge was meeting the threshold of consumer expectations - consumers who regularly shop on Amazon. And that's where hiccups arose, in particular with 4-7 week lead times, and order tracking that only kicked in during the last few days before delivery. There were also a few too many issues with product quality - all covered by warranty, chiefly related to one of ISE's suppliers, and now resolved - but a huge customer support hassle nonetheless. These issues led us to drop the RISE’s Editors’ Scorecard Rating from a 5-star to a 3-star, but we note that this is specifically in the context of retail and small business customers. Large corporate customers would not encounter the same issues, and if they did, they'd be handled much more easily and expediently by ISE. With better, lower cost, and faster-delivering products like the ThermoDesk Elite and Electra now available to consumers, we recommend other stand up desks. However, this shouldn't reflect negatively on other products of ISE’s. The RISE comes with an outstanding 10-year warranty on the table - electrical components are guaranteed for 3 years - which should give you some indication of just how sturdy these desks are.